Before Lunar New Year, I had ordered two 3000 F, 2.7 V supercapacitors from China for about $4 each. I don’t actually remember why, but they arrived (unexpectedly) just before the holiday. Supercapacitors (often called ultracapacitors) fill a niche somewhere between rechargeable lithium cells and ordinary capacitors. Ordinary capacitors have a low energy density, but a high power density: they can store and release energy very quickly. Lithium cells store a lot of energy, but charge and discharge at a comparatively low rate. 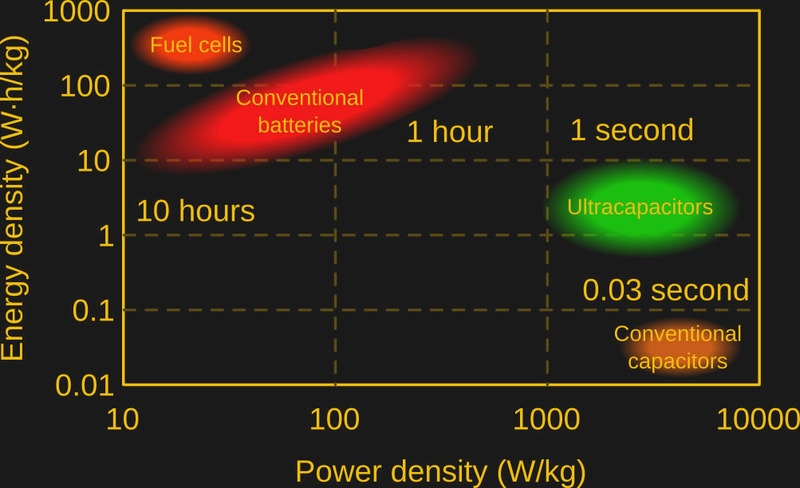 By weight, supercapacitors store on the order of ten times less energy than lithium cells, and can deliver something like ten times lower power than capacitors. Overall they’re an odd technology. Despite enthusiastic news coverage, they are a poor replacement for batteries or capacitors, but their long lifespan and moderate energy and power density make them suitable for some neat applications in their own right. Notably, they’re used in energy harvesting, regenerative braking, to extend the life of or replace automotive lead-acid batteries, and to retain data in some types of memory. You’re not likely to power your laptop with supercapacitors. Spot welders are one of the very few pieces of metal working equipment that are actually very much cheaper to build yourself than to buy commercially. In fact, between salvaging a transformer out of an old microwave and buying some of the other components, it’s doable for under $100USD in most cases. We’ve shared this hack quite a few times before, but [Albert van Dalen] has really taken the cake on creating a very detailed and extensive guide to not only building his, but how to properly use it for various purposes. [Albert] designed it in a way that allows it to be configured in both opposed and series electrode positions which means besides being able to spot weld sheet metal together, you can also spot weld battery tabs while on cells! Spot welders are super handy for making sheet metal enclosures for your projects. The problem is, commercial ones are rather expensive… The good news is, they’re actually really easy to make! This is [Caio Paulucci’s] first submission to Hack a Day, and it was a weekend project him and his father just finished. A spot welder works by dissipating large amounts of heat in between two electrodes in the material you are bonding. It makes use of a transformer that converts mains voltage to a very low voltage, but high current energy source. The cool thing with this type of welder is it’s perfectly safe to hold onto the electrodes as the voltage is so low, you won’t get electrocuted. By running a super high current (generally >1000A @ ~1-2V) through a small surface area, you can super heat most materials hot enough to weld them together. They can be made using the transformer from a microwave, some heavy duty welding wire (generally 2/0 or thicker), and a few other odds and ends such as wood, electrodes, and maybe a few nuts and bolts. At the most basic level, you are basically re-wrapping the transformer’s secondary coils to change the ratio to produce a low voltage, high current transformer.